Enjoying this fantastic weather? 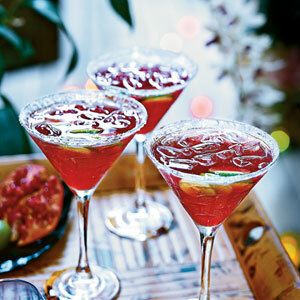 Well our Cocktail of the day is a Pomegranate, Lime & Vodka Delight! This is so so scrummy and even just looking at this pretty cocktail makes your mouth water!! If you’ve got some Vodka already, it’s quite inexpensive to make too! Pretty simple actually. Mix the sugar and water in a small saucepan and slowly bring to the boil. Reduce heat, and simmer for 2 minutes or just until sugar dissolves. Remove from the heat and cool. It should be a sugar syrup now. Add the club soda, pomegranate juice, vodka, and lime juice. Place crushed ice in a martini shaker; add about 3/4 cup pomegranate mixture. Cover and shake. Strain into a glass. 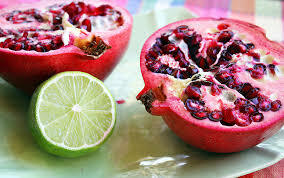 Garnish with a lime slice and some pomegranate seeds, if desired. For real perfection, prepare the syrup a day ahead, and keep it in the fridge until you’re ready to mix the cocktails. Also, for a professional touch, sugar the rims of the glasses. Sit back, relax and enjoy. Ahhhh…..
← Fancy a tipple with Mumford and Sons?